The Spanish program in Middle School follows the introduction to language in earlier grades. Beginning in Grades 5 and 6, students delve into basic vocabulary and grammar in a curriculum that emphasizes conversation, games, and group interactions. A hallmark of the Green Acres language program is learning about the cultures of the Spanish-speaking world. Students study geography, differentiating various countries and societies, from Spain itself to European-influenced Latin America to native peoples of Central and South America. In Grades 7 and 8, most classes are held in Spanish, as students are able communicate in Spanish much more readily. As in earlier grades, the program comprises both language and culture studies, as students create their own cities, develop travel brochures, and delve much further into geography of Spanish-speaking countries. Language study at Green Acres presents opportunities for students to broaden their view of the world and expand their knowledge of humanity’s similarities and differences. Each winter, Green Acres seventh graders participate in a three-week exchange with students from the Leonardo da Vinci School in Lima, Peru. Begun in 1998, the program matches visitors and hosts in an enjoyable and educational cultural exchange that involves class events, field trips, and if the weather cooperates, the first snowfall some Peruanos have experienced. 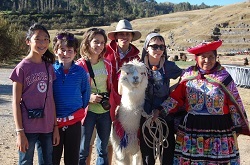 In the summer, several Green Acres students complete the exchange by spending three weeks in Peru, exploring Peruvian history and culture through various excursions. They practice their Spanish in an authentic context, and experience daily life as a student in Lima, participating in regular classes and school activities. The trip enables participants to develop greater self-awareness, openness to new lifestyles and viewpoints, and lasting friendships.